We won another award! 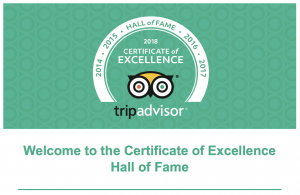 TripAdvisor has informed us that we have earned their Certificate of Excellence for 2017. In addition, as we have received this award every year for the past five years, we qualified for their Hall of Fame. This award adds to our collection showing our dedication to offer the very best we can. For more on our successes and news, see our blog posts.